The Ebola epidemic in West Africa has killed almost 9000 people, infected 22,000 and decimated the weak healthcare systems of Sierra Leone, Guinea and Liberia. The worst outbreak of Ebola now appears to be slowing, especially in Liberia which now has just a handful of cases. 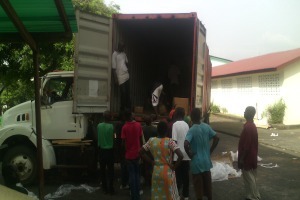 The Caritas response continues in Liberia with more aid arriving as staff member André Stelder reports. A pickup truck donated by Cordaid (Caritas Netherlands) has been cleared at the port. It’s now in the compound awaiting registration and insurance. Containers with aid have been unloaded from the Dutch ship Karel Doorman. They’re being stored in Mother Pattern College of Health Sciences, still closed to students because of the epidemic. 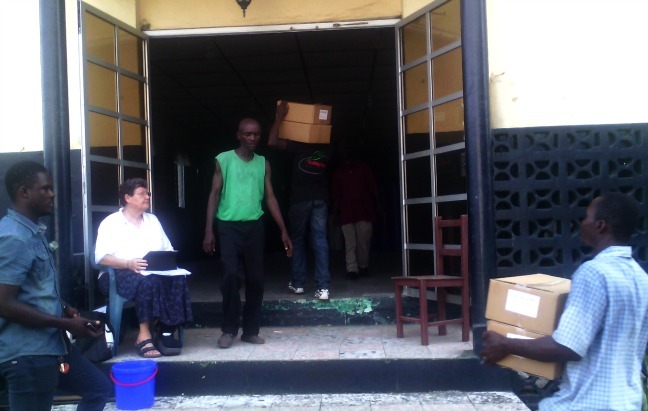 The National Catholic Health Council and the clinics in Liberia have been working relentlessly from day one of the Ebola crisis to address the medical issues. They are grateful for every container with medical supplies coming in. Currently, the most direly needed supplies were the gynecologic gloves as they were almost out of stock. 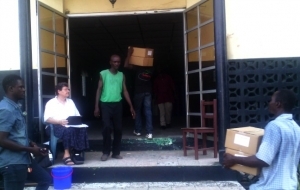 Ebola protocol requires wearing double pairs of gloves during deliveries and examination. Except for protective gear for the Catholic clinics, there were also buckets, soap, chlorine tablets, bleach and thermos guns. Besides that, seven off-the-road motorbikes were on board, which will allow Caritas staff to carry the Ebola message to the most remote villages. Sr. Barbara, the Dean of the Mother Pattern College of Health Sciences, ardently monitored the offloading, seated on a chair with her broken foot in a cast. She compared the quantities offloaded with her shipping documents. Luckily everything seemed to be in order, with the exception of only two damaged buckets out of 5500 delivered. An ambulance donated by Caritas Senegal appeared to have been meant for Guinea, but as Guinea then probably received the ambulance meant for Liberia it is just a matter of exchanging the documents. The recruitment of staff for the project has been completed, and a team of professionals started Monday 2 February. The first training of volunteers from the counties bordering Sierra Leone took place last week in Bopulu by the HIV team of the College of Health Sciences. The stigmatisation attached to Ebola is similar to HIV so they’re a good resource. There was also the first reporting to the Bishops’ Conference. The Bishop of Gbarnga, Cape Palmas and the Archbishop of Monrovia are all very much involved and give their advice based on their long experience attending to communities in Liberia. After the medical intervention, now the humanitarian “aftercare” is getting on track. Ebola has almost subsided, but the aftermath of the epidemic will be felt in communities for a long time to come. Now our focus is providing support, especially counseling, to the survivors, the most affected families and the orphans.